Normally receiving and sending IDOCs can be easily done by using BizTalk Adapter for mySAP Business in BizTalk Server which is included in Microsoft BizTalk Adapter Pack 2.0. But what if I want to send an IDOC using SSIS and BizTalk is installed on a different server? Below are the steps on how you can do that. Note: Since SSIS 2008 only supports <= .NET 3.5 all custom assemblies that will be called within it should be using this framework. 3. SAP Libraries x86 – this needs to be installed on C:\Windows\SysWOW64 folder. 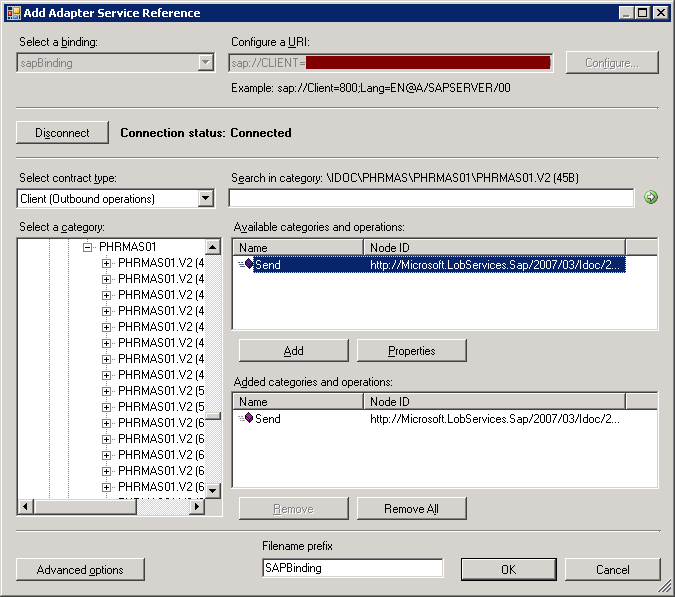 See section for SAP Adapter in this Microsoft Adapter Pack 2.0 install guide. Next step is to create an IDOC WCF Client that you can call inside SSIS. 1. Open Visual Studio -> Create a new Project Library. 2. Right click the Project -> Click Add Adapter Service Reference. 4. Click Configure and set the credentials, then click Connect. Since we are sending IDOCS the contract type should be set to Client (Outbound operations). 5. In the Category, browse for the specific type of IDOC and version, when generating the schema you might encounter an error : “Error returned by RfcCallReceiveEx while calling RFC: IDOCTYPE_READ_COMPLETE..”, It means that you’re selecting an incorrect version of the IDOC, you should ask your SAP resource to identify the Release Number. Select the Send and click Add. Click OK. This will generate a WCF client that you can call inside SSIS. 6. Sign the Assembly, compile and deploy to GAC then copy to C:\windows\Microsoft.NET\Framework\v2.0.50727. It’s necessary to copy to this folder so you can add a reference to it in SSIS. 1. Add a data flow. 2. Set OLE DB Source / File / etc. 3. Add a Script Task, set the script task to Script Destination. Double click the script task and change the target framework to .NET 3.5 by going to project properties. Add reference to the IDOC Library. Create the IDOC object and pass it to the IDOC WCF Client. //Assign Properties and segments of IDOCS here. // explicitly configured here for demonstration. //Get a new GUID to pass to SendIdoc. You can also assign a null. //value to have the adapter generate a GUID. // confirm the transaction on the SAP system. Very nice post! 🙂 Just a question: is there an easy way to manage a IDOC Flat and not a simply IDOC in the way you showed in your post? Without using BizTalk it would be hard to convert the xml to a flat file idoc. You may need to do .NET coding or rely on third party libraries. The clarity to your submit is just excellent and i can assume you’re an expert on this subject. Fine with your permission allow me to take hold of your feed to keep updated with forthcoming post. Thanks a million and please keep up the gratifying work. Hi I am using a dll which was bulid in SSIS 2005 now I have migrated it to SSIS 2008 but from SSIS package its not working . I don’t get any error just the script returns a failure.Please guide how can I approach to resolve it as the dll code was not written by me.